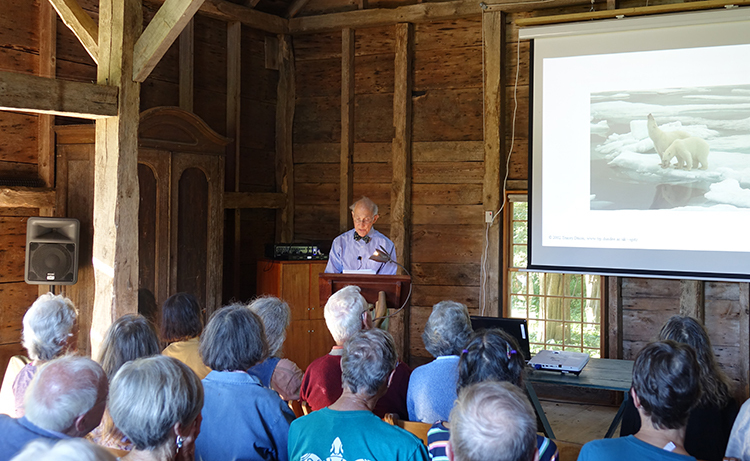 Attendance was lively at our annual summer lecture series held in the Far Barn. Our summer evening lecture series allows us to bring leading figures in horticulture, science, and garden design from around the world to share new ideas with PHA members and the Vineyard community. The major theme of this past summer’s programs was natural garden design, reflecting an attitude shift gaining momentum in the field. Ecological landscape designer Claudia West began the series with the inspiring talk, “Wild and Neat: Bridging the Gap Between Great Garden Design and Ecology.” She championed the idea of creating gardens that mimic the beauty and ecology of a truly wild natural landscape. For those interested in delving deeper into this hybrid between natural and cultivated gardens, we recommend Claudia’s recent book, Planting in a Post-Wild World: Designing Plant Communities for Resilient Landscapes. Dr. Eric Chivian explains the importance of protecting polar bear habitat, not just for the preservation of the species, but for their importance to human health research in the areas of osteoporosis and kidney disease. Another highlight of the summer series was Dr. Eric Chivian, founder of the Center for Health and the Global Environment at Harvard Medical School, who spoke on how medical models can help us understand global environmental threats. One example he presented was forest fragmentation and the attendant loss of biodiversity, which has led to increased rates of tick-borne illness in humans. This event, co-sponsored by the Vineyard Conservation Society, drew a crowd of over 100 and was the subject of two articles in the Vineyard Gazette. In August, PHA hosted a program by wildlife biologists Dr. Luanne Johnson and Liz Baldwin of BiodiversityWorks. Their popular talk focusing on snakes of Martha’s Vineyard fascinated audience members of all ages. They introduced the seven snake species (none of which are poisonous) that live on Martha’s Vineyard. In addition they explained their ongoing study of black racer snakes, which is providing valuable insights into the behavior of this Island species. The audience—who all had a chance to touch a live snake if they wish-ed!—left convinced of the importance of snakes to the Island’s ecosystems. We look forward to further collaborations with BiodiversityWorks in the upcoming months. Stay tuned for a class on animal tracks and signs this February! This winter we will be offering lectures and workshops during the colder months in our new Education Center and Botany Lab. In addition, our guided “winter walk” tours resumed November 11 and will continue on the second Saturday of each month through March. For dates, details, and our complete winter schedule, visit our programs calendar at pollyhillarboretum.org. To receive email updates, subscribe on the homepage of our website.